The hollowbody archtops that Ibanez has been producing for decades just keep getting better. 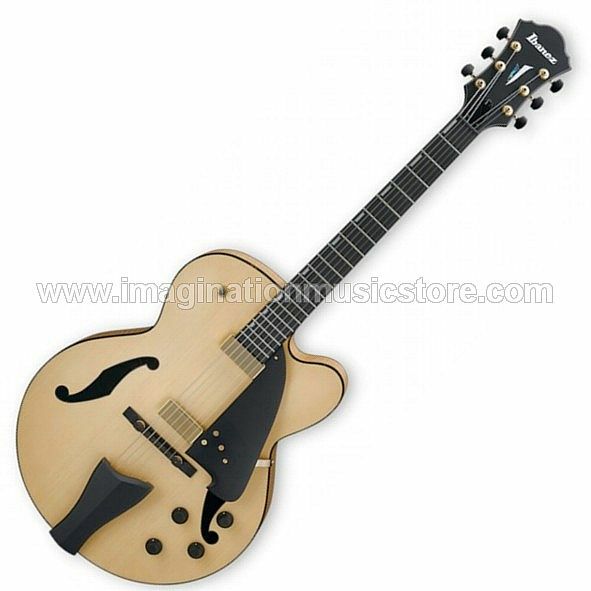 Case in point: the Ibanez AFC95 Contemporary Archtop 6-string hollowbody electric guitar. This elegant instrument features select tonewoods, custom pickups, and tone controls that give the modern player the historic jazz-box sound with enhanced creative freedom. The Magic Touch-Mini passive humbuckers let you express sweet highs and mellow lows without annoying 60Hz hum, and the bound ebony fingerboard is given Ibanez's Artstar fret edge treatment for smoother left-hand action. Its solid ebony compensated bridge transmits every string vibration faithfully to the spruce top, which can resonate freely, thanks to the AFC95's floating pickup and tailpiece design. No, they're not really magic, of course — but they sure are innovative! Since these mini humbuckers are positioned above the surface of the arched top (one mounted to the neck and one mounted to the pickguard), there's no interference with the vibration of the spruce top. So the alnico windings pick up all the vibes of the AFC95's flatwound strings, and that means bigger, fuller-sounding tone for you. Plus, they're humbuckers, so you won't need to worry about 60-cycle hum if you want to crank up the volume! The AFC95 Contemporary Archtop is a looker, for sure. But it's not just made for the showcase; this performer has pipes, thanks to specially chosen tonewoods used in its construction. It features a laminated spruce top that resonates beautifully but also helps reduce feedback, so your music comes through with minimal distortion — a must-have feature for many Sweetwater players. The AFC95's maple back and sides project solid midrange frequencies with serious amplitude, and that ebony bridge isn't just attractive; it improves sustain so every note sings out at full strength with endurance in spades. Ibanez has given the AFC95's frets some extra TLC in the form of their Artstar fret edge treatment. Near the binding, the frets' shoulders are rounded off, and their ends are tamed down a bit, resulting in a bullet-shaped terminus that makes soloing a treat. This is a level of care not usually found in guitars at this price point, and it makes all the difference in playing comfort. Both of the AFC95's Magic Touch-Mini humbuckers have their own controls for bass/treble balance and volume, and they're intuitively positioned just off the custom-designed pickguard. The pickup selector is located right up top, just north of the 18th fret, where your right hand is naturally poised to select the neck or bridge pickup. These thoughtful placements will enhance your ability to dial in just the right tone precisely and efficiently.